Nothing makes this girl happier than a good love story. Fortunately, the animal word delivers with some especially unique and unexpected relationships, starring our adorable furry, feathered, and scaled friends. Below are five of my favorite animal love stories of all time. This book is close to my heart. Carol Buckley, founder of Elephant Aid International, has worked as the CEO of an Elephant Sanctuary in my homestate of Tennessee for the past 15 years. This book was also chosen by the state of Tennessee in 2012 for submission to the National Book Festival in DC. Owen, a baby hippopotamus, was stranded after the Dec 2004 tsunami in Kenya. Mzee, a 130 year old tortoise, became his friend and playmate. This remarkable relationship has spurred additional books and kid’s activities. See www.owenandmzee.com for details. Koko was my first introduction to the idea that animals could communicate with us and feel compassion and empathy for other living beings. Koko has been featured in a fantastic PBC documentary illustrating her comprehensive grasp of sign language. Additional information about Koko can be found at The Gorilla Foundation. PBS nature also has additional links for more information about Koko, pictures, and a sign language game for children. 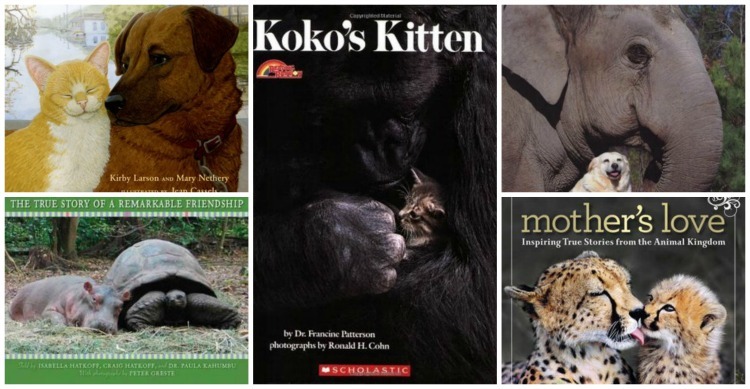 In the interest of full disclosure,many of the individual animals featured in these books have passed; each one a poignant reminder to truly cherish all the tiny moments of love present in our daily lives. Here’s hoping you spend this day, week, and month embracing your love for one another and all God’s creatures! We will definitely check out these titles -DD is a huge animal fan. Thanks! Piwi Mama – I'm so glad. I hope they are a huge hit – I think these books would be very, very easy to turn into little unit studies 🙂 Please let me know how it goes! Beanie N Us recently posted…Foodie Fridays – Sandwich fun! These sound so sweet! I love seeing mother animals care for their babies – so natural and beautiful! LOVE this list. We love Owen and Mzee and will have to find the rest of these books! Love this idea of animal love (unexpected!) in nature! Makes me feel all warm and fuzzy! I love this post and all of these wonderful pictures !! I loved reading through your post. I haven't read any of the books, but think it might be a good idea to get some and read to my grandchildren. Thanks for your article. Wanted you to know I will be featuring your post this week on Mom’s Library! Ashley – that’s soooo exciting! Thank you!! !